The first photo (by Abdul Qodos of Reuters) shows an older man killed in the bombing. The next 2 photos (taken by Abdul Khaleq for the A.P.) 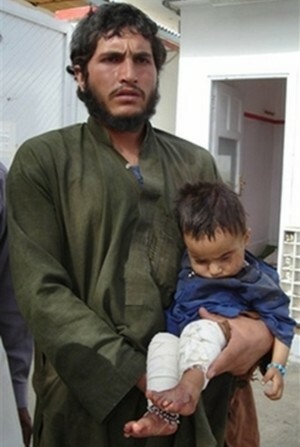 show a small boy injured by US/NATO bombs and a woman wounded brought for treatment at the Emergency hospital in Lashkar Gah. During the night of August 25/26, 2007, in a village located ~25 kms south of Musa Qala town, Helmand Province, at least two homes were bombed by US/NATO aircraft after an earlier firefight. "So far between 60 killed and wounded people have been recovered and there are people trapped under collapsed houses…"
"It was a quiet evening and the bombardment began all of a sudden. Cattle have also been killed….We can't do anything, can't stay in our villages and can't go anywhere…it is best for us to be killed all at once than being killed every day." 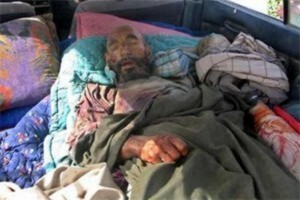 "If the Taliban shoot at NATO or American convoys, then NATO and Americans come back and bomb all of the area. And when we bring our casualties to the hospital then they say they are Taliban,"
and the US corporate media duly records the US/NATO lie which gets splashed all over the front pages. A spokeswoman for NATO's force said that 12 militants were killed in the overnight clash, which started after Taliban fighters ambushed a joint US and Afghan army patrol some 25 kilometers (16 miles) south of Musa Qala. As if on cue, NATO said that no civilians were killed, a claim which could be independently verified to be a lie (per Emergency above). 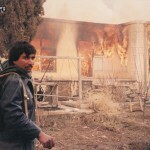 The photos provide incontrovertible independent evidence that civilians were killed and injured by the US/NATO bombing. U.S. spent 3 million USD on boats for Afghanistan that were never used, inspector general says.